A seven-part lesson series on painting the illusion of water with gouache (opaque watercolor). 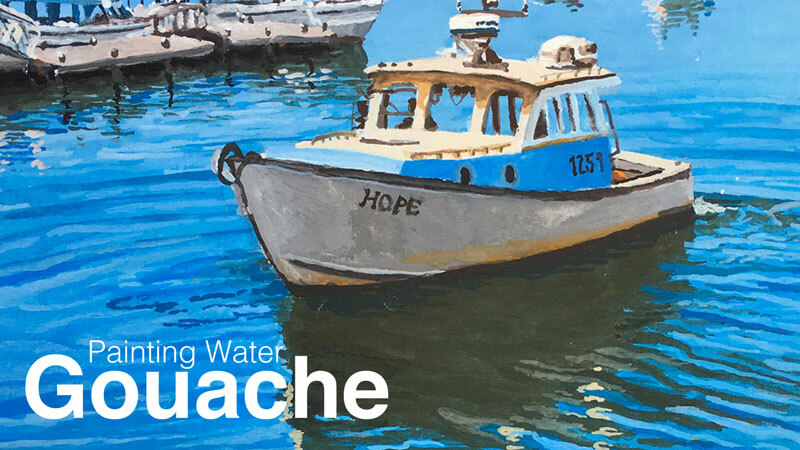 Learn how to use this incredibly versatile medium that shares characteristics of both watercolor and acrylics to develop the illusion of water in a painting. This series takes you step by step, from drawing to finished painting, so you won't miss a single brush stroke. I just watched part #1 today (will watch Pt. 2 live tonight). Have some questions from part #1: Will you scratch the “perm green” and continue with a Sky Blue, Primary yellow mix instead? Was tree line still wet when you scrip brushed the light line beneath the tree? Would you have preferred under other circumstances to have used same ratio, larger size dimensions for final work? Did you know you would use a kneaded eraser with the HB initial drawing and is that a choice allowing greater flexibility as opposed to using an H lead for initial drawing? I noticed that the initial drawing seemed dark and after seeing you pick up the excess with the K eraser, it seemed a good strategy to preserve paper surface while controlling excess lead. Just wondered if that was why you used the HB lead in the first place. So excited! Gouache is my favorite & there are so few good tutorials. I can hardly wait. Thank you! Great lesson, thanks. Finished both lessons last night & am eager for tomorrow’s. Hope to catch it live. Glad that you appreciate the qualities of gouache. I do believe it has great possibilities for larger works, having done several 12 x 16 landscapes with it. Some contemporary artists are using it in an impressionistic style. Let’s go large & loose next time! Ready to do another pan pastel? Watched lesson #6 over again today as a storm was interrupting the video last Thurs. Very informative to watch the stones emerge and also to see toward the end how the gouache covered the stones to “submerge” them under water. I have not been panting along as I am still doing graphite work but plan to follow the videos when I am ready to work with the gouache. I am looking forward to it as I am unfamiliar with gouache but love watercolor!! And I like the apparent flexibility of the gouache. Looking forward to tonight and looking forward to hearing about mother & baby !!! Matt, thanks for another great gouache tutorial. It is my favorite medium & I enjoy your appreciation of it. Can I download an ebook for this? Hi Robin, Ebooks are included with course videos. Unfortunately, Live Lesson series do not include ebooks.